In late April, many Kettering residents received this yellow mailer. It was not produced or mailed by the City of Kettering. It was produced by Kettering citizens Ron Alban and Sterling Abernathy. The information contained in the mailer was not verified by the City of Kettering. 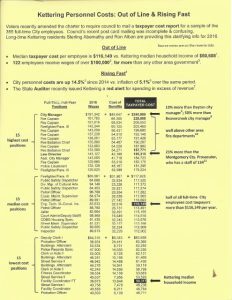 Kettering City Manager Mark Schwieterman gave a presentation at the May 9, 2017 City Council meeting to address the information included in this mailer. You can learn the facts by reading the Response to Mailer Regarding City Salaries or by watching the following video segment of the presentation from the City Council meeting. As always, a complete and searchable database of salary information for all City employees is provided on the Transparency portion of our website. This resource is accurate and goes far beyond the information contained in the yellow mailer. Should you have any further questions about the recent mailing please contact the City Manager’s Office by phone at (937) 296-2412 or by email at KetteringCityManager@Ketteringoh.org .